The countryside of Shiota Spa, Hyogo (17 October 2003). The countryside of Yunogo Spa, Okayama (18 October 2003). Past February Indra Das, a friend of mine working at the University of Pennsylvania, came to Hyogo Ion Beam Medical Center in Harima Science Garden City, Hyogo, Japan. He looked at the accelerator installed there and did some experimental work with it. In the evening before his return to USA, he and I met in Osaka and had a chat over supper. I took two sketchbooks with me to show him the small works I made during my trip to Italy and New Zealand. The sketchbook I used in Italy included some works from domestic trips. 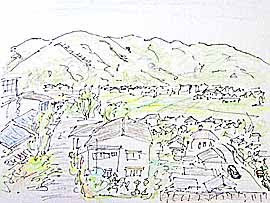 When I opened the page of a sketch made in Shiota Spa (the upper picture), Indra instantly said to my surprise, "This is Hyogo!" Sure, Shiota Spa is located in Hyogo. 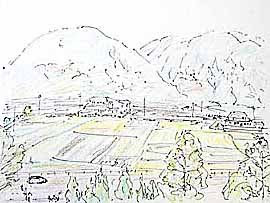 The scenery sketched seems to be very similar to the one he used to see during his stay at the Medical Center.